As you are preparing to sell your home, there are hundreds of things running through your mind at once. From thinking about moving to your new home to coordinating everything you need to begin selling your home, this is a busy time. 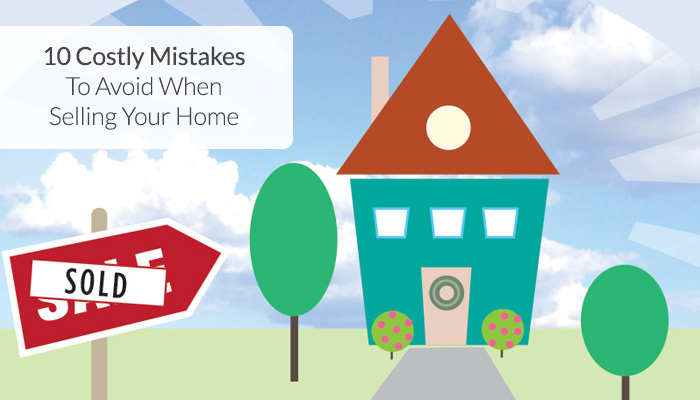 Before you jump in feet first, check out these 10 costly mistakes to avoid when selling your home, to help ensure you receive as much return as possible on your home. Intentionally hiding problems with your property is not a good idea. These problems will be uncovered during the buyer’s inspection of the home. It is also a huge turnoff for buyers if they realize you are trying to withhold information or misrepresent your property, often causing them to no longer consider your property. Overpricing your home can scare buyers away or cause them to immediately rule out your home because it is not in their price range. Continually lowering the price on the home also makes it look like you are desperate to sell. On the other hand, under pricing your home will cause you to lose out on potential revenue. Finding the ideal market price for your home is important to the success and speed of the sale. Having your home appraised or assessed before putting it on the market provides you with the fair market value of your home. This allows you to know what the bank will approve the buyer with, ensuring you will not have to make up the difference when closing. A pre-sale inspection will prepare you for what an inspector will find when going through the house with a potential buyer. This inspection will help you know what needs to be fixed, disclosed or if the price needs to be adjusted at all for repairs. When starting negotiations, ask the potential buyer to provide their pre-approval letter or proof of funds for a cash purchase. There is no reason to start making compromises or spending money fixing things on your property if they cannot buy from you. It is important your home is represented by quality, flattering photos. Since there are thousands of homes listed online and most home buyers starting their search online, your home needs to be well represented to stand out! The MLS is a centralized database of homes for sale. Hundreds of sites including Zillow, Trulia, Homes.com, Remax and many more utilize the MLS. This means homes listed on the MLS will have a much better chance of being seen by the desired audience. It is important to make sure any obvious repairs that need to be made are done before listing the home. You do not want to lose a potential buyer due to the need for an obvious repair. It is also important to clean your home and stage it before showings. The changes in presentation can help increase potential buyer’s opinions about the home and increase their offer. If you take the time to clean up the interior of your home but forget to mow the lawn, pull weeds and/or trim the bushes or trees, you could lose buyers before they even enter your home. It is also important that the exterior of your home is in optimal condition before photos are taken for your listing. Your family has spent years creating memories and your life in this home. People are going to start walking through your home, critiquing the layout and furniture and then offering you less money than what you think you deserve. These factors make it easy to get emotional and take offense during the process, but it is important to keep a level head and not let anything cloud your judgment. From start to finish, Space Simply provides all of the expert advice and services that a full-service realtor provides. We will take you through each stage of the selling process. When preparing and listing your home we help you successfully price your home, disclosing proper information to potential buyers, provide quality listing photos, tastefully list your home in the MLS and much more! During the showing and closing process, we help with showing the home, providing feedback, leading all negotiations to return the maximum value possible to you as well as all closing proceedings. Learn more about the proven process Space Simply utilizes to help you save money and contact us today online or call (515) 423-0899 for more information!